Doux Printemps (which means sweet spring in French), is the name of my latest knitting pattern, published on march 20th on Ravelry. But let’s go back to the first quarter of 2015. In order to have a bit more visibility and regularity for publishing new designs, I had decided to create 4 knitting patterns (shawl or accessories), one for each season, to be published in 2016, at each season change (which means you can expect a new pattern on June 20th, then September 22nd and December 21st). For the other season, you’ll see when that time commes, but for Spring, I had this vision of an orchard in blooms and “Thinking about japanese spring” from (Vi)laines was the perfect color to stick with my theme ! I want to thank Catherine, my lovely model, who supported my eccentric ideas without complaining at all ! 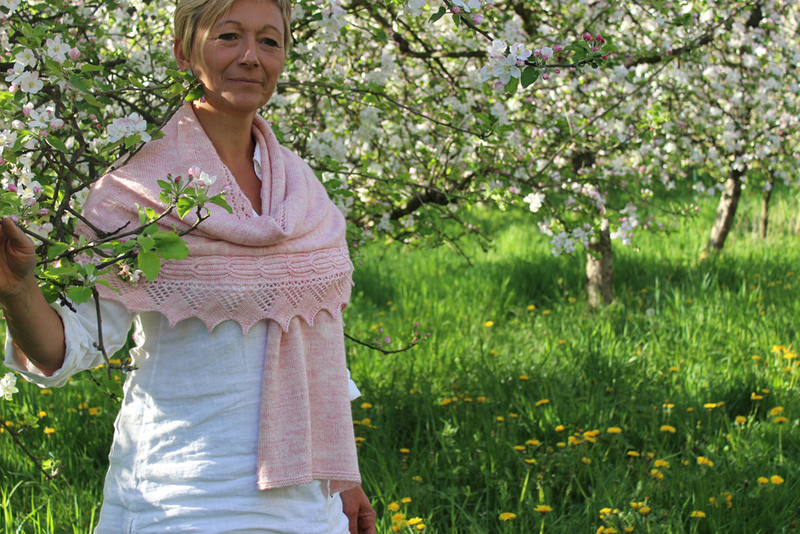 Doux Printemps is a light and soft wrap perfect for enjoying sweet and lovely Spring days (and warm yourself up when the sun doesn’t want to show up). Decorating both lengths, lace and cables bring just enough fantasy and sophistication to this otherwise simple pattern. In the middle, short rows give a slight curve to the stole so it drapes even more easily on the shoulders. Don’t hesitate to share your progress on Instagram and Ravelry using #KALdouxprintemps and #instantsdelouise.